A police officer stands by pieces from a bomb explosion Saturday in front of the Greek parliament in Athens. 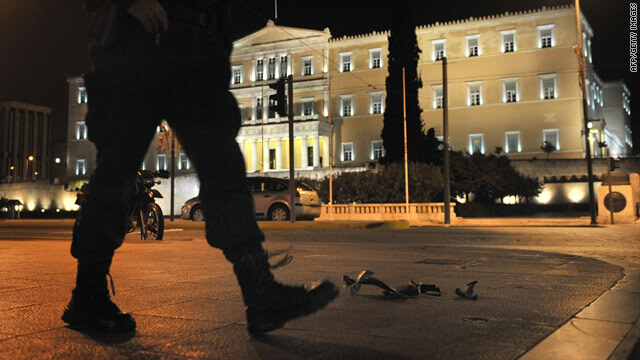 Athens, Greece (CNN) -- A bomb exploded outside Greece's parliament building in central Athens on Saturday evening, a blast near a national landmark that unnerved the country. There were no casualties in the blast, and Greek Prime Minister George Papandreou told reporters that Greeks would not be intimidated by such acts. "My message is simple: democracy cannot be terrorized," he said when he arrived at his parliament office. Police were alerted immediately after the Eleftherotypia newspaper received a call saying a bomb was placed in an open area outside of parliament. Authorities closed off part of the boulevards in front of parliament and on the eastern side of the building before an explosive device detonated inside an installation for garbage disposal. Later, a caller phoned a police emergency line and said one bomb was placed outside of parliament and another inside the Hotel Grande Bretagne near parliament. The hotel entrance faces one of the closed boulevards. Melios Dimitris, Hotel Grande Bretagne manager, told CNN he had not heard of an immediate threat to the hotel and that the business is operating as usual. Law enforcement officers were carefully combing the area, local media reported, but police don't think those threats are credible. Greece's tomb of the unknown soldier, a major tourist attraction, is opposite the parliament building.